Laura Pickler (Jennifer Garner) is the kind of woman who doesn't accept defeat lightly. 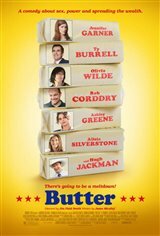 That's why when her husband (Ty Burrell), 15-time winner of the town's butter carving competition, wants to step down, she takes it upon herself to win the championship title herself. And she'll do whatever it takes to save her family's reign in the spotlight, even if it means complete sabotage of her two biggest competitors — a 10-year-old foster child (Yara Shahidi) and husband's hard-living mistress (Olivia Wilde).